Readily available for sale in the UK daffodil bulbs are grown for the range of spectacular flowers and are best planted in the early autumn when the soil is still warm. Try a well drained soil in a sunny position, these bulbs also grow well in pots and containers. Excellent when planted in large clumps or drifts, look for bulk or wholesale quantities for sale at cheaper prices. When growing in containers large groups of bulbs generally look best, however remember that they are hungry bulbs and will need fertilizer during the season and repotting each year in fresh potting mix to perform and flower at their peak. 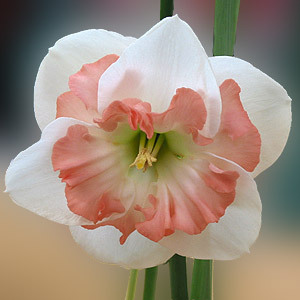 And as for flower colour, yellow is the classic daffodil, however many cultivars exist with pink and white cups as well. Different combinations of pink, yellow and white, some with tinges of red. Double and single flowers, ruffled cups, such a wide variety of flowers to suite any taste. You can also look at the Hoop Petticoat Daffodils, more delicate than the large flowering types. Daffodils do look best if they are planted in groups of the one variety, so stick with large groups of the one type rather than random planting. Proper care and planting Narcissus or Daffodil Bulbs will provide a fantastic display of flowers in spring. Planting is simple, generally plant them at twice the depth as the bulb is high. So the larger bulbs, which are around 2 inches tall are planted so that they are covered by about 4 inches of soil. You will find that if left in the ground for a few years, daffodil bulbs will pull themeselves to a depth that they are happy with in your climate and soil. Bulbs are best planted in a humus rich soil prepared a month or two before planting, generally plant at three times the the height of the bulb. Fertilize with a liquid seaweed fertilizer and remember not to remove foliage until it has died back as this provides the energy for the bulb for the next season. Daffodil or narcissus flowers are popular when grown in pots or naturalised into the garden. Species Narcissus or species Daffodils are easy to care for and are also fascinating and worth a place in the garden.